Inaugural train service runs through San Gabriel trench. 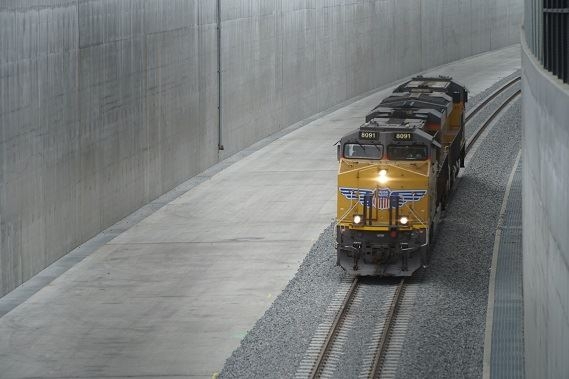 The first train service rolled through the San Gabriel trench earlier this week. While full train service from Union Pacific Railroad and Amtrak has yet to begin, the trench’s inaugural train signals the nearing completion of a five-year project that sought to mitigate the impact of rail line traffic on the community. The trench is billed as one of the largest construction projects the city has undertaken at $312.8 million. The trench is 30 feet deep, 65 feet wide and 1.4 miles long. The Alameda Corridor-East Construction Authority (ACE) excavated over 500,000 cubic yards of soil and used over 33,000 dump trucks and 6,500 concrete trucks to complete the project. The purpose of the trench was to relocated rail traffic at four busy intersections. With railway tracks relocated below-grade in the trench, construction crews also constructed four bridges at Ramona Street, Mission Road, Del Mar Avenue and San Gabriel Boulevard to ensure a constant flow of motorists and pedestrians over railway traffic. The final step in completing the trench is for Union Pacific Railroad officials to install new mainline tracks inside the trench. Once installed, construction crews will then remove the railroad shoofly – or temporary track – that currently lies adjacent to the trench, thereby eliminating railroad crossings at four intersections within the city. Work on the mainline track was originally scheduled to begin earlier this year, though severe rainfall and weather conditions in the state forced Union Pacific to refocus their work elsewhere to address service interruptions to their rail network. Once completed, the city of San Gabriel says the new trench will reduce congestion at four crossings by nearly 90,000 motorists, improve rail reliability for an average of 18 trains per day, eliminate noise caused by locomotive horns and crossing bells and reduce pollution caused by idling cars and trucks. More importantly, the new trench will also improve safety by eliminating delays for emergency responders at railway crossing points.